Blog / Post / How Often Should I Change The Water Filter On My Refrigerator? How often should I change the water filter on my refrigerator? In our business, we hear that question so often, and I cringe every time I hear it. Your water filter should be changed every 6 months to a year. Your owner’s manual will be helpful in determining how often to change your filter. It might be time to drag out the warranty booklet and see just what kind of water filter you have. Many water filters are underneath the unit, behind the kick panel, so it isn’t unusual for people to forget about them entirely. However, regularly changing your water filter is not only important for your own health, but also the longevity of your fridge. Your water filter can only hold so much in the way of impurities and minerals. After the filter is saturated, they either leach the bacteria back into your glass or the membrane is eliminated, so the water will just pass through the yuck. If you don’t think regularly replacing your water filter is important, try tapping the filter on your counter. You will see a black and green gunk come out that will quickly change your mind. City water is pretty good, but as we all know, there is a good reason why people drink filtered and bottled water! So, at minimum, change that water filter every year, without fail, for your continued good health! 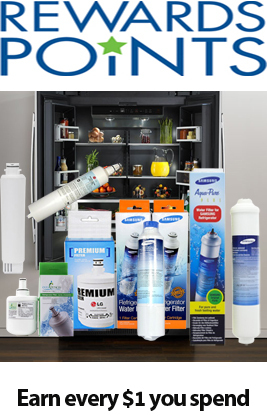 This entry was posted	in Refrigerator Filter Information On Jun 25, 2015 .